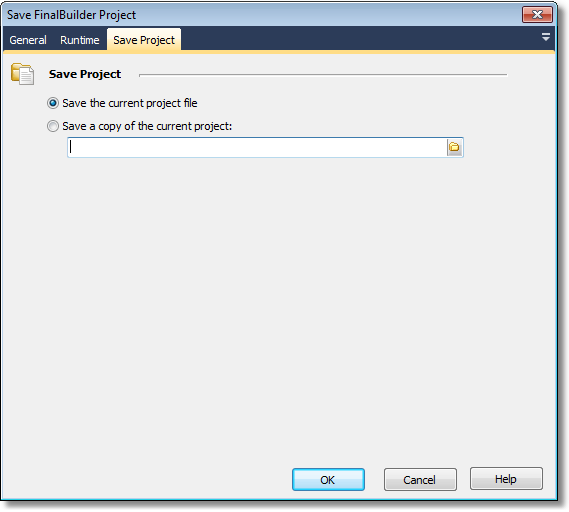 The Save FinalBuilder Project Action allows you to save the current FinalBuilder project from inside your build. Reasons you may want to do this include saving changes to action properties, and saving the status of persistent variables. Saves the current project to the current project file. The equivalent of choosing File -> Save in the FinalBuilder IDE. A copy of the current project will be written to the file you specify.